【로스앤젤레스=뉴시스】 류강훈 기자 = 미국 인디애나폴리스의 호스피스 병동에서 마지막 생을 정리하고 있는 과거의 단골손님을 위해 225마일(약 362㎞)이나 떨어진 곳까지 피자를 배달해준 점원의 이야기가 미국 사회에 감동을 주고 있다. 리치 모건과 아내 줄리는 25년 전 미시간주 배틀 크릭에 살 때 2주에 한번씩 급여를 받을 때마다 동네에 있는 '스티브스 피자'를 찾았다. 이 곳에서 먹는 피자를 가장 좋아했기 때문이다. 현재 인디애나주의 인디애나폴리스에 사는 부부는 올해 아내 줄리의 생일에 오래 전의 추억이 깃든 배틀 크릭에 있는 스티브스 피자를 찾아가기로 했었다. 그러나 리치는 암이 급격히 악화돼 부부의 추억여행을 포기했다. 현재 그는 아내의 보살핌 속에 호스피스 병동에서 얼마 남지 않은 삶을 정리하고 있다. CNN과 NBC 뉴스 등 미 언론들은 22일(현지시간) 리치 모건 부부와 감동적인 피자 배달 사연을 보도했다. 리치 모건과 아내 줄리는 배틀 크릭을 떠나 여러 곳을 이사다녔지만 신혼생활을 시작했던 배틀 크릭의 스티브스 피자를 지금도 최고로 여긴다. 어디를 가든 스티브스 피자를 기준으로 다른 피자의 맛을 평가했을 정도다. 줄리의 친정아버지 데이비드 돌키는 딸과 사위가 스티브스 피자를 먹으러 여행갈 계획을 세웠다가 암 증세가 악화돼 무산된 것을 알고 안타까운 마음에 스티브스 피자에 전화를 걸었다. 돌키는 스티브스 피자의 점원에게 딸과 사위의 안타까운 상황을 이야기하고, 바쁘더라도 문자메시지 한 통 보내줄 수 있겠는지 물어봤다. 단골손님이 오랜만에 가게를 찾아오길 바랐지만 그 계획이 무산됐다는 소식을 듣고 아쉬움이 크다는 내용의 문자메시지를 부탁한 것이었다. 그런데 불과 5분 뒤 다시 피자 가게로부터 전화가 왔다. 수화기에선 어떤 피자를 원하느냐는 말이 나왔다. 친정아버지 돌키는 225마일이나 떨어진 가게의 점원이 어떤 피자를 원하느냐고 의외의 질문을 한 것에 놀라면서 엉겁결에 "페퍼로니피자와 버섯피자"라고 대답했다. 돌키에게 전화를 걸어 주문을 받은 이는 스티브스 피자 가게 업주의 손자인 돌튼 셰퍼였다. 18살인 셰퍼는 대뜸 가게 문을 닫고 나서 피자 두 판을 배달해주겠다고 말했다. 믿기 어려운 얘기였다. 미시간주에서 인디애나주까지 배달이 가능한 거리도 아니거니와 스티브스 피자는 원래 배달서비스를 하지 않는 가게였다. 하지만 셰퍼는 정말로 3시간30분이나 차를 몰고 가야하는 장거리 배달에 나섰다. 피자가 도착한 시간은 새벽 2시. 피자 두 판을 들고 먼 길을 왔던 셰퍼는 "전화로 사연을 듣고 두번 생각할 것도 없었다"면서 "이런 일을 할 수 있어서 행복했다"고 말했다. 그는 수고비 한 푼 받지 않았고, 눈 좀 붙이고 가라는 제안에도 아침에 일을 해야한다며 곧바로 돌아갔다. 세상에 둘도 없는 귀한 피자를 받아든 리치와 줄리는 감동의 눈물을 흘렸고, 줄리는 일주일 전 이같은 이런 스토리를 페이스북에 올렸다. 마지막 삶을 정리하는 옛고객을 위해 아무 대가 없이 왕복 450마일(약 724km)을 움직인 18살 청년 셰퍼. 그로부터 세상에서 가장 값진 피자를 건네받은 줄리는 "이 세상에는 더 많은 돌튼 셰퍼가 필요하다"는 소망을 썼다. 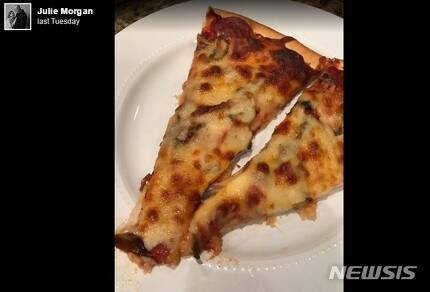 (CNN)When Julie Morgan and her husband, Rich, lived in Battle Creek, Michigan, they would stop by Steve's Pizza for dinner every payday. That was 25 years ago. To celebrate her birthday this year, the couple -- who now live in Indianapolis -- wanted to take a trip to their favorite pizza place. Instead, they ended up in the ER, where Rich Morgan was told his cancer had worsened and that he had weeks -- maybe days -- to live. He was placed in hospice care. Steve's Pizza doesn't deliver. 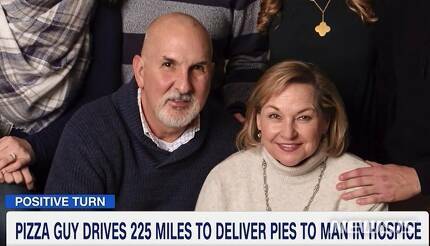 But when a manager at the store heard the couple's story, he decided to take two pies to them himself -- even though they were 225 miles away. During the course of their marriage, the Morgans moved around several times. But for them, Steve's has always been the benchmark by which all pizzas were measured. "I can't possibly describe how delicious this pizza is -- but several moves and all these years later, it is still the gold standard and we've never found a better pizza yet," Julie Morgan wrote on Facebook. When her dad, David Dalke, found out about their birthday plan -- and how Rich's sudden diagnosis dashed it -- he called Steve's Pizza hoping they might send a note to the couple. "I said 'I know you're busy.' I explained the situation and said, 'If you ever make it happen, just a text message to Rich and Julie that you're sorry they couldn't make the trip,'" Dalke told CNN. That's all he was hoping for: a note. "About five minutes later he called me and he said, 'I want to know what kind of pizza they like," Dalke said. It was an unusual request, but Dalke told him anyway: Pepperoni and mushroom. On the other end of the line was Dalton Shaffer -- the 18-year-old grandson of Steve, original owner of the pizzeria. Shaffer told Dalke it was near the end of the night, and as soon as he closed the store, he'd head to the house with their two favorite pizzas. "I said, 'Wait a minute, did you understand that I am in Indianapolis? I'm not next door?'" Dalke said. It's about a three-and-a-half-hour drive between the two cities. But Shaffer said he didn't have to think twice and got on the highway without telling anyone from his family or the store. "It was kind of a spontaneous reaction," Shaffer told CNN. "I'm happy I did it, and on the trip down I was happy doing it." Dalke kept the lights on and waited until 2 a.m., when Shaffer pulled into their driveway. Shaffer handed Dalke the two pizzas, and got ready to drive back to Michigan -- another three-and-a-half-hour drive. "I told him to come in, have something to eat, drink. I asked if he wanted me to put him up for the night," Dalke said. "But he said 'I've got to get up because I've got to go to work the next day.'" Shaffer wouldn't take any money. He just drove back home, completing a 450-mile, seven-hour journey. His remarkable act a week ago has inspired people everywhere since Julie Morgan posted about it on Facebook. Dalke said what the world needs is "more Daltons." "There's so much goodness in people -- and there are people in this world that will stretch out, and care and not think twice about it," he said. "We're going through grief but, by golly, there's something good that's happening." And that's the message Shaffer hopes to spread with his act of kindness. "I have already gotten a ton of phone calls from people saying they were inspired in the future to help other people and to be able to do things like that. To me, that right there is what I want," he said. "I just want people to think about the family and pray for them." Update 5:19 pm ET: Since publishing this story CNN learned that Rich Morgan died Saturday after a two-year battle with cancer, according to his wife, Julie Morgan. She wrote, "He fought so hard and dealt with his illness with incredible grace, courage and humor. He was a man of faith and integrity who was always driven to do the right thing. There are no words to express how deeply we loved and admired him, and how much he loved us in return. Thank you so much for the outpouring of prayers and support." Julie Morgan is with Rich Morgan. Sometimes a slice of pizza is more than it appears to be! Read on for the story of an epic pizza delivery and the unbelievable kindness of a stranger. 25 years ago we lived in Battle Creek, MI. We were young and money was tight but every pay day, Rich would pick up Steve's Pizza for dinner. I can't possibly describe how delicious this pizza is - but several moves and all these years later, it is still the gold standard and we've never found a better pizza yet. Rich has frequently critiqued other pizza as "good but, it's no Steve's." Rich and I recently planned a weekend getaway to Michigan to celebrate my birthday. We talked about seeing the leaves and the lakeshore, but that was secondary to our planned visit to Steve's. Instead, I took Rich to the ER where he landed in ICU for five days, and where we learned the news that his valiant cancer battle was coming to an end. Rich is home under hospice care and we are enjoying every minute reminiscing and visiting with family and friends. Unbeknownst to us, my dad contacted Steve's Pizza and spoke to Dalton, a manager there. He told Dalton a little bit about our situation and asked if the shop might send a friendly text or card to us. Without hesitation Dalton asked what kind of pizza we wanted, and told my father he would bring it to us (by the way, Steve's doesn't deliver). My dad clarified that we were in Indianapolis, at least three and a half hours away from Battle Creek. Dalton said he understood that, and would leave after he closed the store. And so, while Rich and I slept, at 2:30 AM, Dalton rolled into our driveway, left the car running and delivered two extra special pizzas to my waiting family. He told them we were in his prayers, and offered to help in any way he could. My dad offered to put him up in a hotel, but he refused and immediately left for the return trip home because he had to work the next day. I am beyond overwhelmed and humbled by this act of genuine kindness. Dalton brought our family so much joy - and the best pizza in the world - at a really difficult time. While "thank you" hardly seems adequate - from the bottom of my heart, thank you, Dalton from Steve's Pizza in Battle Creek, MI for making your epic middle of the night pizza delivery!